Sant Jarnail Singh Jee took Amrit at the tender age of five; from this very young age, being committed to his nitnem (daily prayers), became his lifelong aim. Until the age of 11, he remained in village Rode and would recite 110 Jap Jee Sahibs and the Panj Granthi, daily; all whilst undertaking his farming duties. He remained at his village and was engrossed in meditation for 11 years. Every year Sant Gurbachan Singh Jee Khalsa Bhindranwale would tour the villages of Punjab delivering sermons on Gurmat. When Sant Gurbachan Singh Jee arrived at village Rode he asked Baba Joginder Singh Jee for one of his seven sons, Baba Joginder Singh Jee told Sant Gurbachan Singh Jee that they had free will to choose whichever son they wanted; they chose a young boy, Jarnail Singh. Sant Jarnail Singh Jee was educated in the knowledge of God, by Sant Gurbachan Singh Jee Khalsa. Within a year they learnt the correct pronunciations of Gurbani and the history of the Guru’s. In 1966, Sant Jee was married at Village Bilaspur with Sardar Sucha Singh’s daughter, Bibi Pritam Kaur. He has two sons, Ishar Singh and Inderjeet Singh, born in 1971 and 1975 respectively. 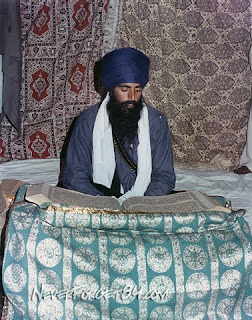 After Sant Gurbachan Singh Jee Khalsa ascended to Sachkand, Sant Kartar Singh Jee, Bhindranwale, was appointed the Jathedar of Damdami Taksal. Sant Kartar Singh Jee, Sant Jarnail Singh Jee and Sant Baba Thakur Singh Jee were very close and would discuss issues of the Panth together. In 1977 Sant Kartar Singh Jee was involved with a serious car accident which resulted in them being admitted into hospital. Sant Kartar Singh Jee was advised to undergo an operation, which involved removing their Kes, Sant Kartar Singh Jee refused this operation, opting to keep their Kes and their Sikhi intact. Sant Jee told Baba Thakur Singh Jee to appoint the next Jathedar. Baba Thakur Singh tied the Dastar of Jathedari on Sant Jarnail Singh Jee, after which Takhat Sri Patna Sahib Jathedar, Bhai Mohan Singh Jee presented Sant Jee a Siropa on behalf of the Takhat Sahib. On 26 April 1982, a Morcha (campaign) was started to get Amritsar ‘holy city’ status. Some Singhs of the Jatha and Bhai Amrik Singh Jee, of the All India Sikh Student Federation, (AISSF), were arrested. Sant Jee began the Dharam Yudh Morcha on 19 July 1982 to secure the release of the innocent Singh’s. In March 1983, Sant Jee learnt of the Governments plans to wipe out the Sikhs and the possibility of an attack on Sri Harimandar Sahib. In June 1984, this became a reality when Indira Gandhi gave the approval for the Indian army to storm the Golden Temple complex and another 37 Gurdwaras. It was widely reported by Lt. Gen. Kuldip Brar and other army officials that Sant Jee did not survive the attack was killed. The reliability of the army’s claims of Sant Jee being martyred in the attack are contradicted by other officials, R.K. Bajaj, a correspondent for Surya magazine, claimed to have seen a photograph of Sant Jee in custody, while a Governmental doctor claimed that Sant Jee was alive when captured.